An awesome pair of leather wrist cuffs are a must have accessory for any fair goer. Our leather wrist cuffs are crafted from medium weight leather and are very comfortable to wear. Attaching to your wrist by a strap and small buckle, these leather wrist cuffs are extremely adjustable and will go as small as needed to fit a Child or large to fit an Adult. When laid flat, the cuff itself measures 8.5 inches wide and the way the strap is riveted to the cuff is what allows this great adjustability. 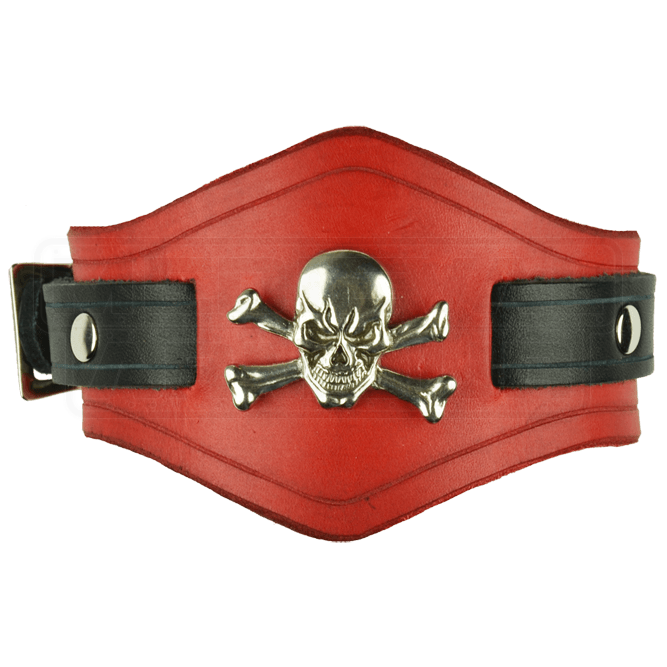 These wrist cuffs feature a mean looking Jolly Roger skull with crossbones. Yes, these wrist cuffs will make you feel like a pirate. The wrist cuff measures 3 inches high at the widest part and tapers down to 1.625 inches to perfectly around your wrist. Available in many color combinations. This version comes with steel hardware.